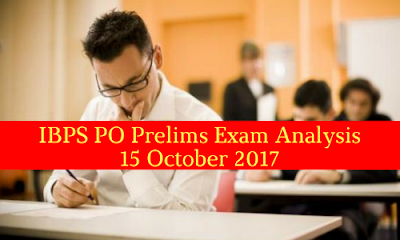 The first slot of IBPS PO Prelims exam which was scheduled to be held today i.e. 15 October 2017 is over. According the information that we collected from our contacts, the exam varied between moderate to difficult questions and there were some questions that took a lot of time of the students. Here is the complete exam analysis of the exam. As stated above, the exam varied between moderate to difficult questions, the ideal attempt for the exam will be 55-65. This section had just three sets. RC, Sentence Rearrangement and Phrase Replacement though students find it difficult because the reading comprehension passage was of very high level and the questions were tricky. Students who were weak in English faced problem in comprehending the passage. While some students find phrase replacement not so difficult, some said it was quite confusing. Similarly in sentence rearrangement, the 10 questions were time consuming. This section was not too tough for the students who had their concepts cleared and their speed in calculation. Data Interpretation was difficult but the other questions in this section did not consume much time. But still this section was not easy to attempt. The questions were tricky and required speed to complete the paper on time. This section had 2 sets of puzzles and seating arrangement each. Thus the whole section revolved around this these 4 sets. Other questions like syllogism, inequality and coding decoding were quite moderate and students did not take much time to solve them. Overall, we can say that the paper was moderate to difficult. We wish the aspirant Good Luck for the results and All the best to the candidates who are going to appear in the next slots.